The Brütsch Spatz went into production in revised form as the Victoria 250. When production ceased on that car, the head of Burgfalke (an airplane and glider manufacturer in Germany) bought the rights to the car and put it into production as the Burgfalke FB250. They used a 248cc single-cylinder making 14 horsepower. In all, 60 were built and two of those were shipped to the U.S. This car is one of those two and it is completely original. It should sell for between $25,000-$35,000. Click here for more info. 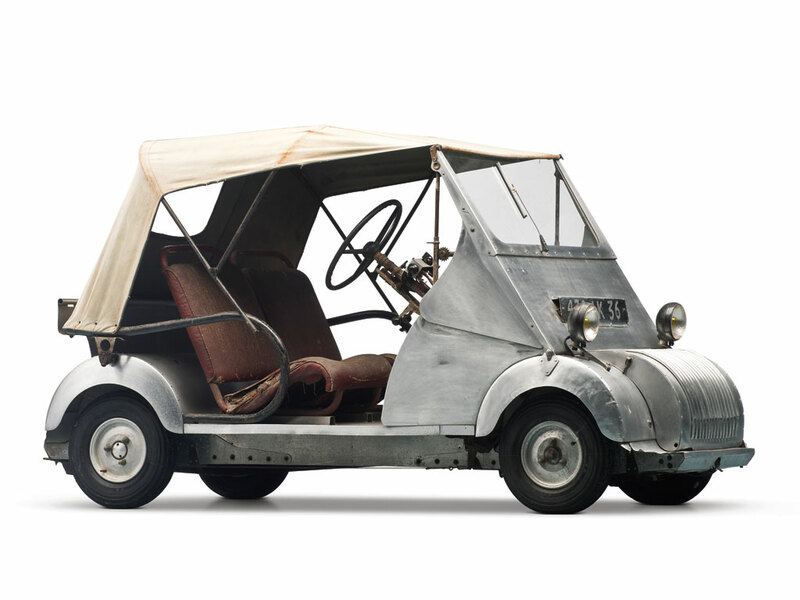 We’ve talked of Gabriel Voisin and his attempt to manufacture a microcar after World War II. When he designed the Biscooter, he built approximately 15 prototypes that he shopped around. Eventually, two of them were given to Voisin to take home. This is one of those two cars. It is completely original. The Biscuter was made in Spain, but this Biscooter was made by Voisin. It’s a pretty big deal. The engine is a six horsepower 125cc single-cylinder. It should sell for between $60,000-$80,000. Click here for more info. Larmar built invalid carriages in Essex, England. When this model hit the scene, they were quick to point out all of its positive, road car-like characteristics in order to drum up as many sales as possible. It was about the smallest road car you could buy and perhaps the narrowest ever built, at just two feet four inches wide. The engine is a 246cc single-cylinder making 7.5 horsepower. This one has not been restored (obviously) and is missing a door, the convertible top and the folding windshield. It honestly resembles an airplane tug more than a car, but it is what it is. It can be yours for the rock-bottom price of $3,000-$5,000. Click here for more. The iconic Vespa scooter was introduced by Piaggio in 1946. It was great for transporting people cheaply around the windy streets of Italy. It was not so great for transporting things. 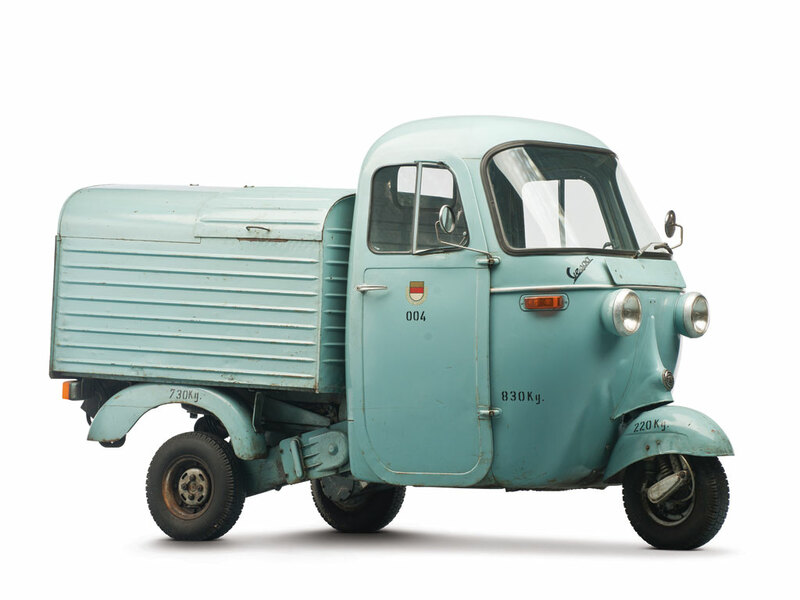 So Piaggio sent their designers back to the drawing board and in 1948 the Ape came to market. This Model C has an enclosed metal box at the rear and a bench seat up front. Payload was 770 pounds – about all the 5.8 horsepower 145.5cc single-cylinder can handle. The controls are still scooter-like and the rear box actually tips. It’s a useful little commercial vehicle. It should bring between $5,000-$10,000. Click here for more. 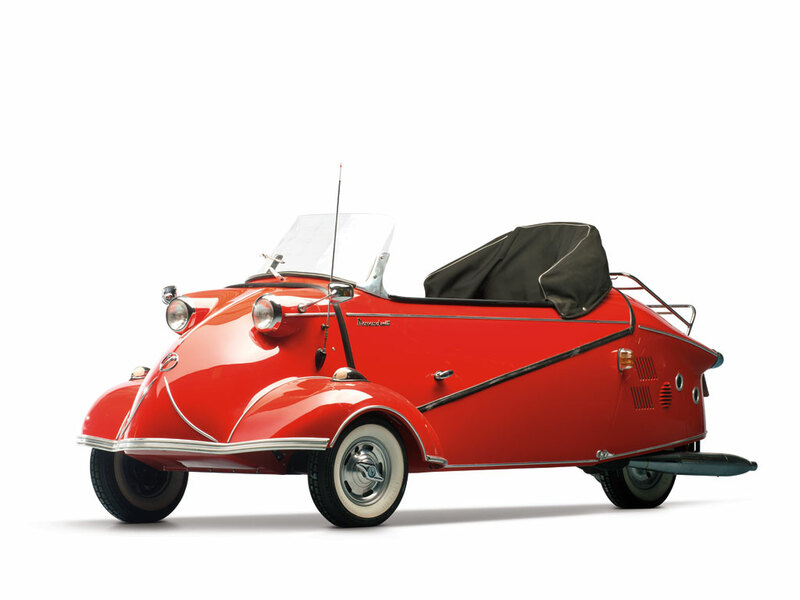 Another Messerschmitt? Look closely, this isn’t a KR 175 or a KR 200. It’s a very rare KR 201. Closed-top cars had an occupant baking problem, as they were essentially in a glass oven. Solution? Cut the top off. They gave it a heavily-raked windshield and a cloth top that goes back most of the way. It was a special edition model with other bits of nice trim and they were only built for two years (1957 and 1958) but it was available by special order until KR 200 production finally stopped. It uses the same 191cc single-cylinder engine making 9.5 horsepower. Only 300 were made. This one should bring between $60,000-$70,000. Click here for more info. 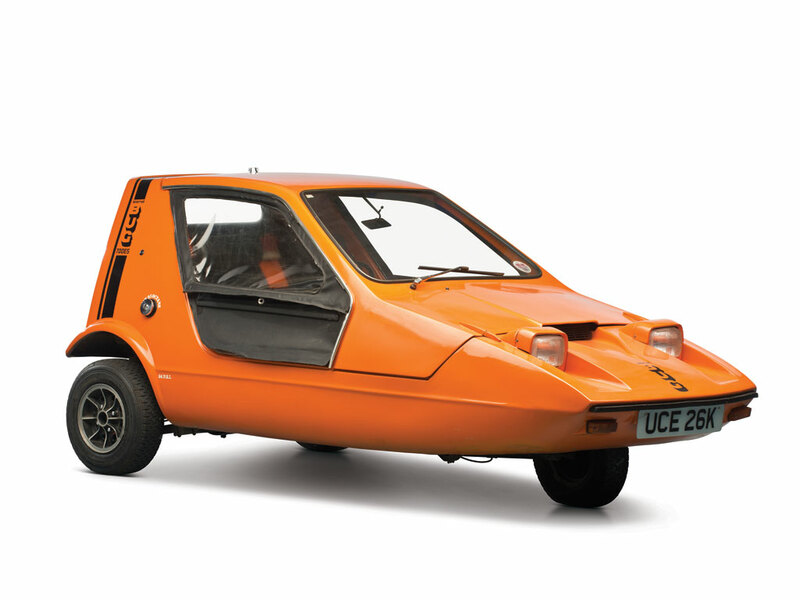 The futuristic Bond Bug was exactly what a futurist would drive in 1972. 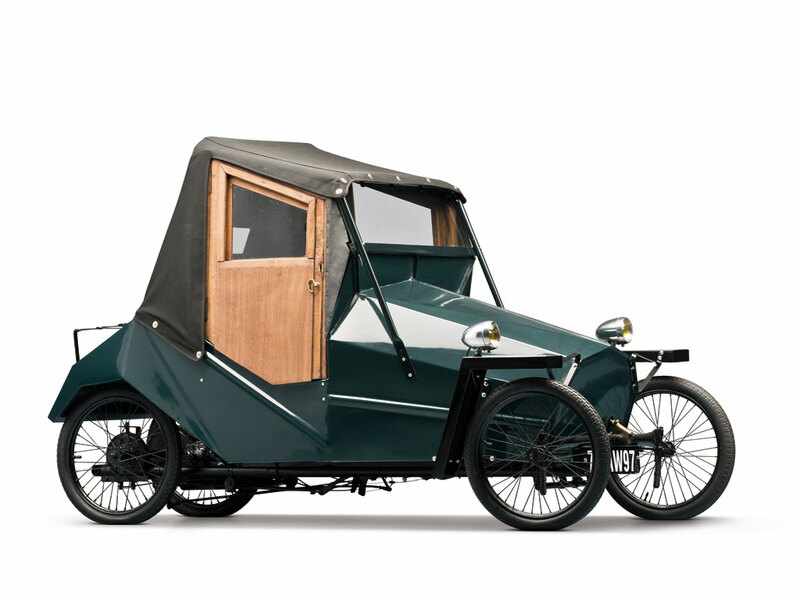 It’s a three-wheeler with a pop-forward canopy for a door. The interior is now dated but was probably modern then. The engine is a 701cc straight-four making 30 horsepower. Bond had actually been acquired by Reliant in 1969 and you can see some of the Reliant Robin-type architecture in this car. Every one of the 2,276 cars built was painted in this god-awful 1970s orange color, which must have helped Bond reach their young consumer target market, or something. This one should sell for between $15,000-$20,000. Click here for more. You might be thinking “Just what in the hell did Peugeot think they were doing trying to build a production car in 1942, under German occupation.” While the first part of that sentence – right up to the qualifier of “trying to build a production car…” is fair game at any point in their history, Peugeot actually had an interesting idea with this car. Gasoline was forbidden once Germany took over unless you had a special permission slip to drive. Literal cyclecars (without engines) were popular. Peugeot went with electricity. They were the only one of France’s large automakers to take a shot with building electric cars. The VLV was interesting – there was a single brake drum for the two rear wheels and the batteries up front made up half the weight of the car. It had a top speed of 22 mph and a range of 50 miles. It got around the fuel-restrictions but was banned by the occupying government after 377 were built. It’s cool, it’s rare. It should sell for $30,000-$40,000. Click here for more. Powell Crosley’s cars are all really tiny and all really cool. 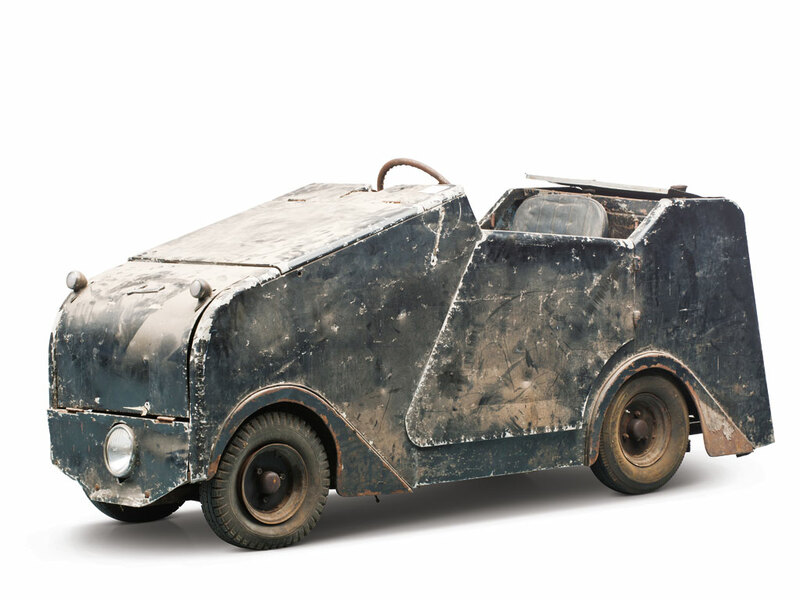 The Farm-O-Road is one of the stranger cars the he built. It looks like a miniature version of the Jeep that helped America win the war that had just ended. 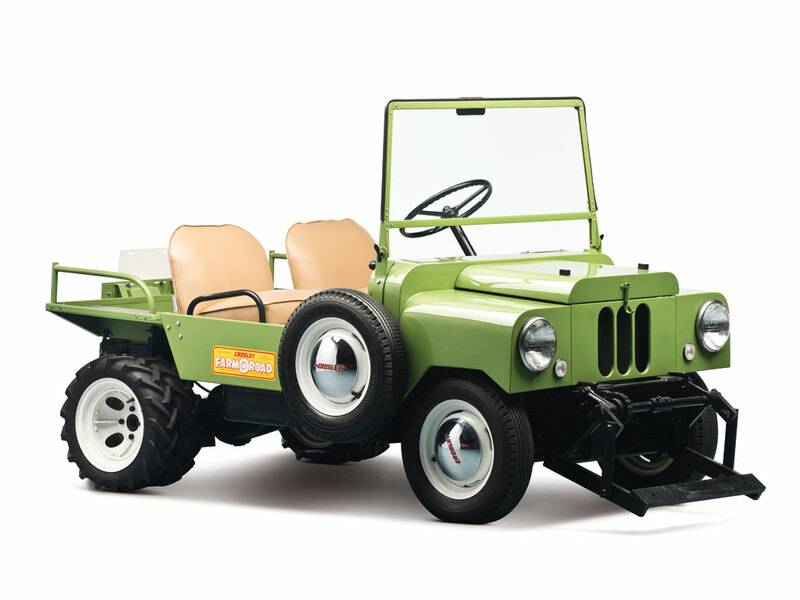 But its purpose was that of a utility tractor, as Crosley “had an interest in farming.” There were all sorts of attachments for this thing: plows, mowers, skis. It was also intended for road use. They were available for three model years: 1950-1952. About 600 were made. This is one of two factory prototypes and the one that was used in factory sales literature. It uses the 724cc COBRA straight-four making 26.5 horsepower. It should sell for between $20,000-$30,000. Click here for more info. 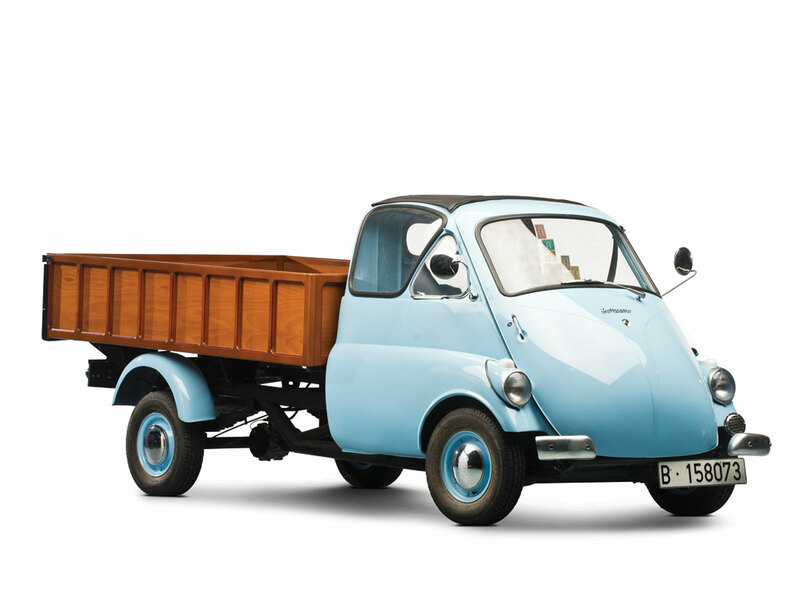 The Isetta was originally built by Iso. They licensed the design out all over the place and used the proceeds to build some wicked sports cars. 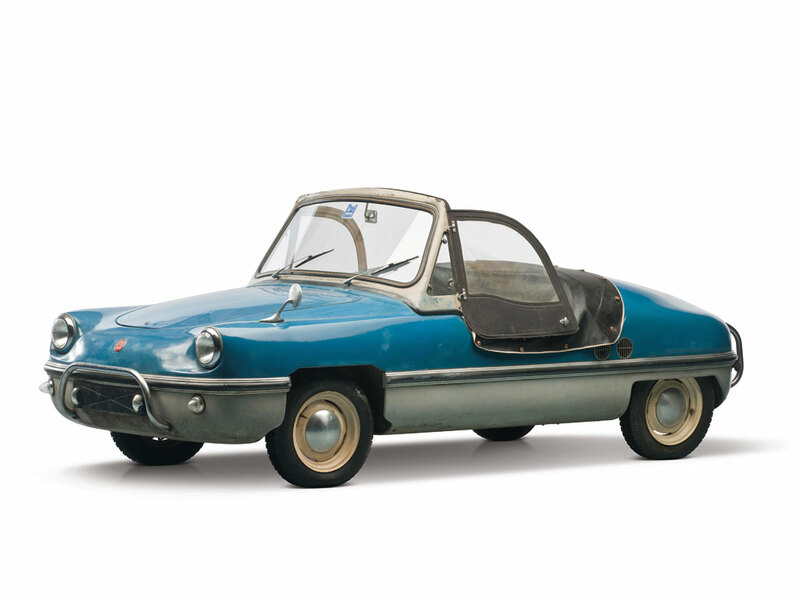 To make the tiny bubble-car even more appealing, Iso built the Autocarro, a commercial variant available in a variety of bodystyles. This one has a wooden pickup box. It uses a 236cc single-cylinder making 9.5 horsepower. It was built in Madrid by the Spanish arm of Iso (but it’s still an Iso). The only difference is that the Autocarro was renamed Isettacarro 500 in Spain. It is one of 4,900 built and is mostly original. It should sell for between $45,000-$55,000. 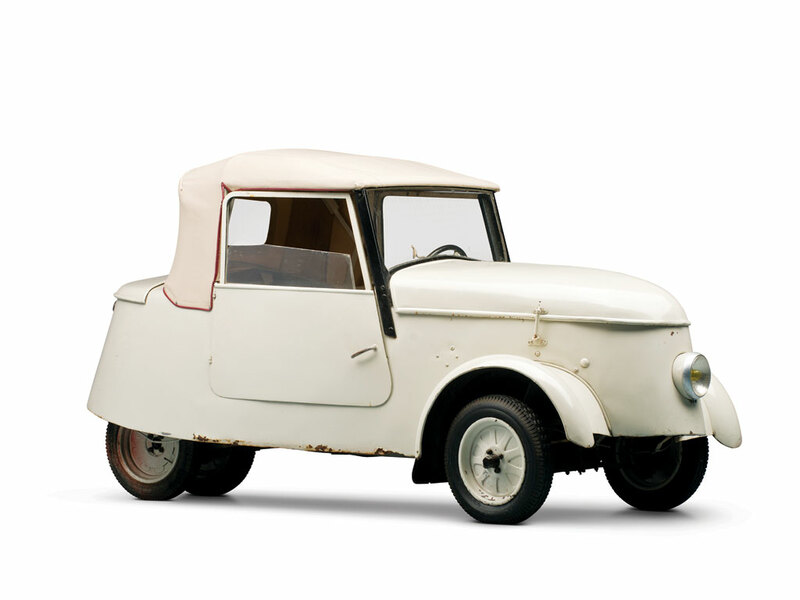 Click here for more info and here for the rest of the lineup, as this is the final Microcar Monday.